This is mostly for posterity to show (and shame) myself for the ridiculous rise in popularity of my current fandom -- Hypnosis Mic. I first posted about them around May last year, when the first batch of merchandise rolled out and I was enamored with the lifestyle goods (tshirts! hoodies! bags!!). However, I was less than impressed with the accompanying slew of acrylics/badges/what-have-yous that used what I call "same-face design." I know that start-up franchises usually have a standard set of images that they use for promotional items and goods but they had so much potential and the artistry of their lifestyle goods held so much promise. True enough, the franchise soon took off and then I realized that you should really be goddamn careful of what you wish for. Fast forward to the present and Hypmic has had innumerable collabs plus merch releases to go with them and they're bleeding my wallet dry. They announced all 12 rapper nendos last WonFes, too. Hell, I still have a smattering of other fandoms here and there but Hypmic tops the lot by a mile. Everything else I used FromJapan. It's really handy especially since I get to participate in box splits with JP sellers, so I got my SamaIchi Pitas Vol2, the Family Mart rubberstraps, and my proudest bit yet -- the Kotobukiya es fest rubberstraps. You think selling them at 10pcs max BLIND would stop me, animate? Think again. 1 - After scouring the net for two long unfruitful years, I finally got the sunny weather Ushijima acrylic to match Tendo. This is a huge deal because I nabbed Tendo during my trip to Japan last 2017 and I couldn't find Ushijima anywhere -- not in Kbooks or Mandarake, I found him at otamart one time but he was ridiculously overpriced and you had to buy, like, 3 other stuff from the seller to get him. But as I was consolidating my January orders from surugaya (which included those v cute Ushiwakamaru acrylics from Fate) I decided to look up Ushijima on a lark and !!! My baby is there. So I got best girl Ushiwaka and miracle boy Ushiwaka, I am fulfilled. 2 - Rio and Doppo doujin acrylics. 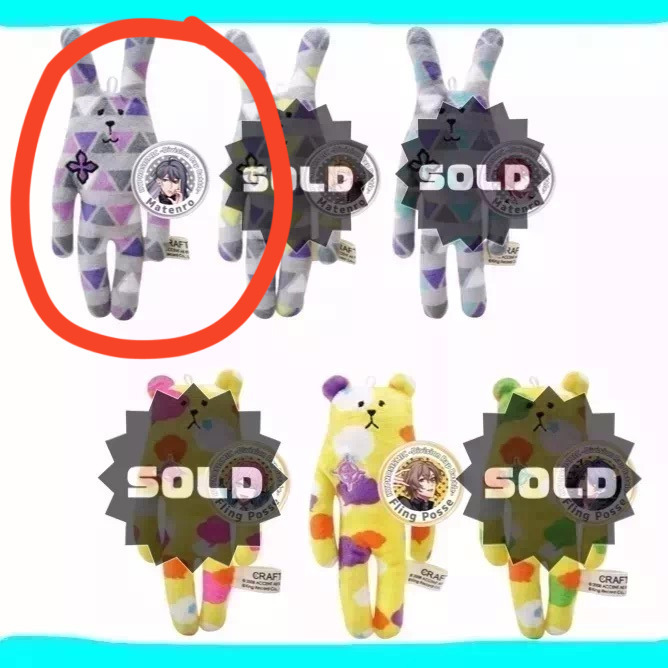 They're my Tier2 OTP following SamaIchi in Hypmic so when the SEGA crane prize bears were announced last year I told myself: any and all animal-themed merch releases you definitely have to get Rio and Doppo. So I got the Chun Colle birds up there and the Rascal Raccoon collab straps coming in April. That was an unbelievably smart call, I almost can't believe it. I didn't PO the Sega bear rubberstraps anymore because at the rate of Hypmic's merch releases, I'm content to have one rendition per style... I'm very strongly side-eying the medium size bears tho, damn u SEGA. solluxcaptor (Il y a 29 jours) #55160027Nice loot! I'm a little curious about this part "It's really handy especially since I get to participate in box splits with JP sellers", could you explain how you do this? I use FJ too and I'd love to get in on box splits with JP sellers.